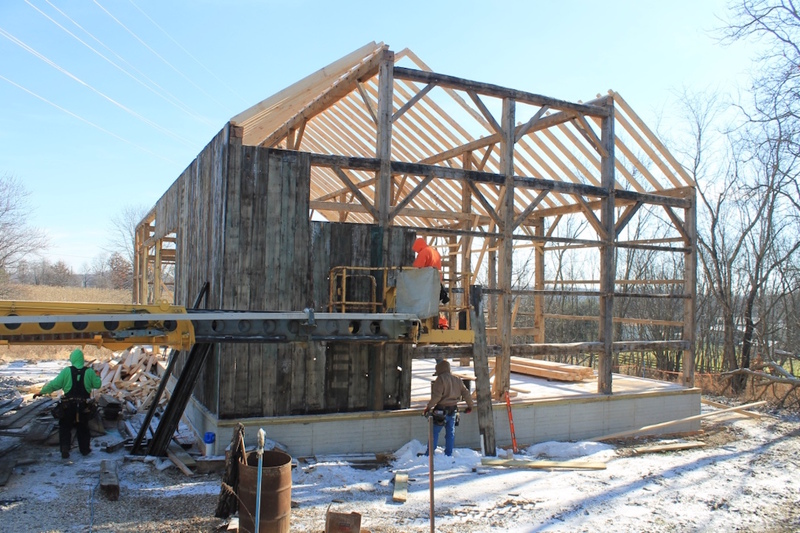 Alan Walter, a member of Friends of Ohio Barns, moves an 1880s timber-frame barn from Strasburg, Ohio to his farm in Carrollton, Ohio. Sugarcreek Builders, LLC. rebuild 1880s barn in Carrollton, Ohio. 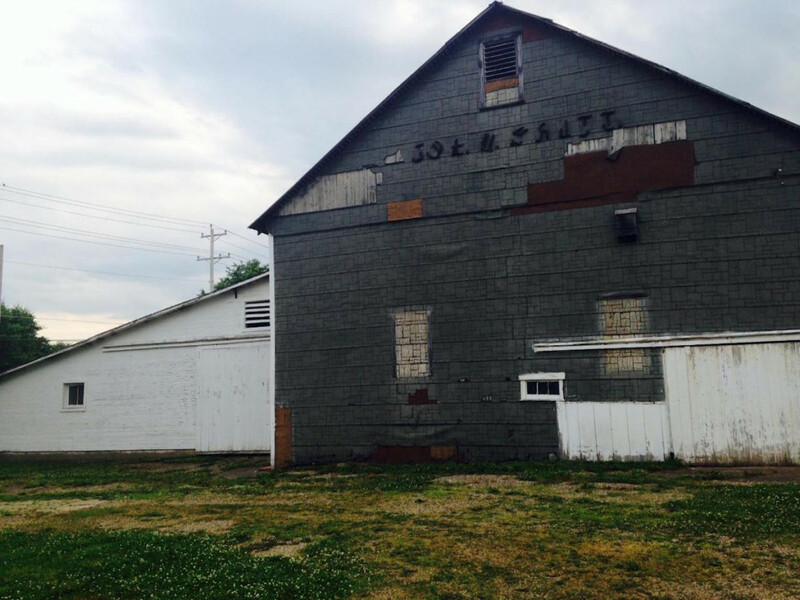 CARROLLTON, Ohio — As a kid, Alan Walter found old barns simultaneously scary — because of the dust and cobwebs — and interesting — because, even then, he knew there was something special about their construction and size. “I have always loved old barns,” said Walter, who is in the process of saving a barn near Strasburg, Ohio, built around 1885, and moving it to his farm near Carrollton. The seed of doing something to save a barn was planted when he visited a Barn Again! exhibit in Wooster in the 1980s and learned how rapidly old barns were being destroyed. 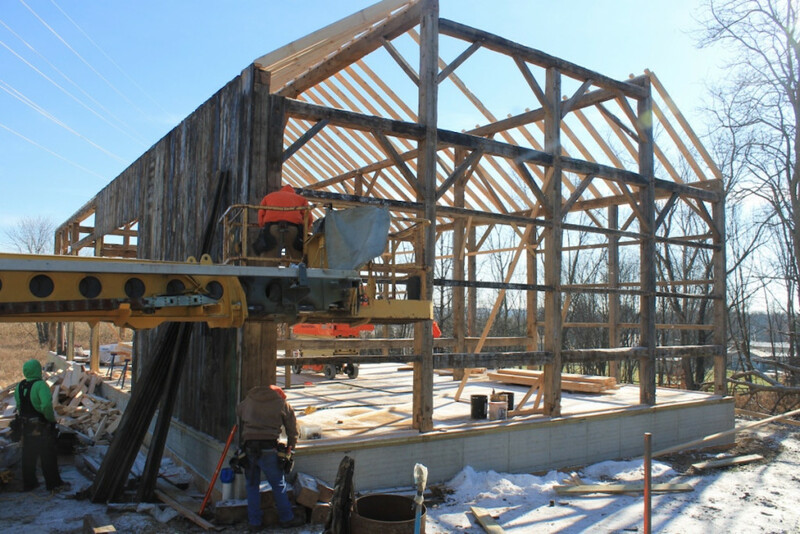 “I finally got serious about trying to preserve one when I attended a Friends of Ohio Barns conference in 2014 and learned that I could move and rebuild a historic timber-frame barn for not too much more money than an equivalent-size pole building would cost,” he said. Pam Gray, the president of Friends of Ohio Barns, commends Walter and his efforts to rebuild a historic barn. “Old barns are the backbone of our country and the heart of families that settled here,” Gray said. Walter found the old barn through his sister talking to her Mary Kay consultant, Bonnie Jones. Bonnie and her husband Dave had bought some of the last land owned by the Shutt family of Tuscarawas County. The annual Friends of Ohio Barns Barn Tour will be in Holmes County April 28-29. 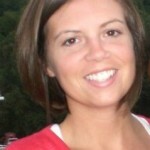 For more information visit www.friendsofohiobarns.org. Most of the farmland had been sold for housing developments and a big piece became the site of the new Strasburg school. An old barn set on the property the Jones purchased and for them, the barn felt like a liability, it was in disrepair and they were glad to sell it to Walter to re-build, rather than seeing it get chopped up for decorative elements. The barn is 36-by-71 feet, with 2,556 total square feet. 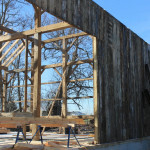 The gable posts are 22 feet tall. 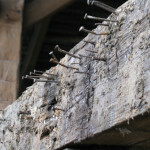 It has hand-hewn posts and beams; circular sawed scantlings, which are smaller connecting pieces. Walter’s best estimate of age is about 1885. It was built on land that had been owned by Daniel and Mary Shutt who settled in Strasburg in 1835. 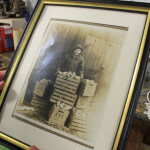 The land was continuously in the Shutt family name until Dave and Bonnie Jones bought it at auction six years ago. “It can’t have been built earlier than 1880 because it contained a hay trolley, which certainly was original to the barn and which has a patent date of Dec. 16, 1879,” Walter said. It took Walter about 40 days to disassemble the barn. Except for the frame and roof, he did all the disassembly himself with some help from family. Sugarcreek Builders, LLC, from Sugarcreek, Ohio, handled the roof removal, tagging each post and beam and disassembling the frame. 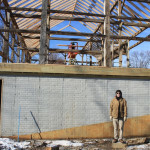 With Walter, they will completely rebuild the barn by this spring. 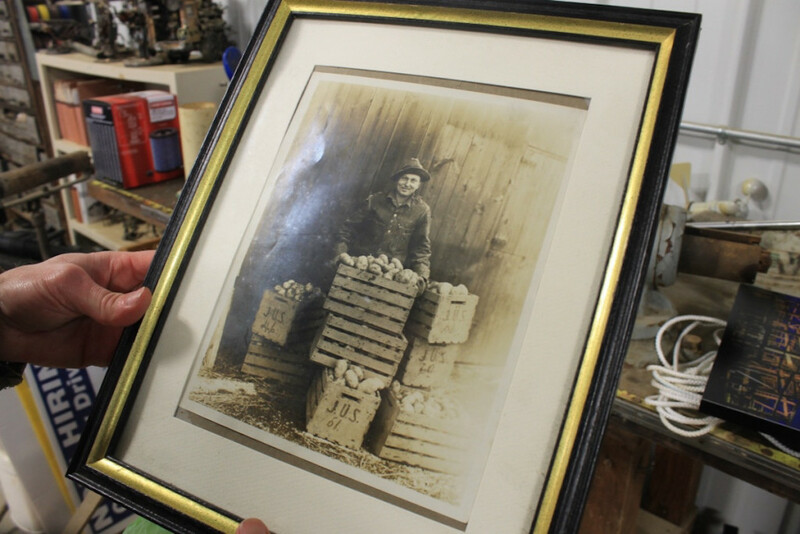 “As I was disassembling the barn, many Strasburg residents stopped in and reminisced about the hours they spent as teenagers working with the potatoes,” Walter said. 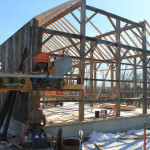 Walter shared that many alterations were done to the barn throughout the years. Two hay mows were built using beams and siding from barns that were even older than this barn. One loft was built from beams from a barn that so old that it had log rafters, likely to have been early 1800s. 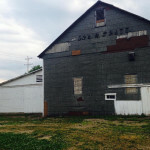 When Walter bought the barn, it had two lean-tos, which had probably been added in the 1950s and 1960s, both in horrible condition and were not salvageable. The tar paper looked ugly, said Walter, but was probably the reason that the barn was in good condition, despite minimal maintenance being done to it in the last 40 years. Walter was pleased to discover that the tar paper had been nailed to American chestnut siding boards that were up to 15 inches wide and were still very solid. “I expect that old-growth chestnut is more rot-resistant than modern pressure-treated lumber because board ends that had been in direct contact with the soil for decades had only 2-4 inches of rot,” Walter said. “Many old barns were built from chestnut and we don’t have chestnut trees anymore. They were destroyed, similar to what is happening with the ash trees today, making the wood and barn even more valuable,” Gray said. Prior to the tar paper, the barn had been painted with what appears to have been cream-colored “milk paint” with all the trim painted in nearly iridescent green. Walter plans to paint it white. 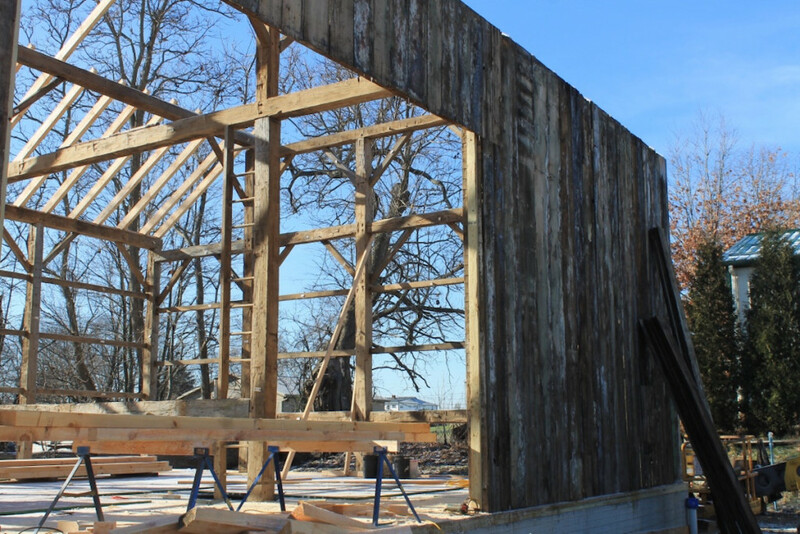 He hired an architect Chuck Bultman, Ann Arbor, Michigan, who specializes in timber frame barns to design the foundation, floor supports, insulation scheme and window layout. “I’m planning to use the barn as a barn for the rest of my life, but it’s likely that I’ll be the last person who will use it that way,” Walter said. Because his site is within the city limits of Carrollton, “it’s likely to become a home, a bed and breakfast, a conference center or a commercial establishment after I’m gone,” he said. He is taking the right steps now, to assist in passing commercial building codes, if needed down the road. The barn had 16 doors in it when Walter bought it, including six in the lean-tos. He plans to reduce that to four doors for his use. It had only two windows, and he plans to add 20 to allow plenty of natural light in. The granary had been built like a vault, Walter said. Its floor was 2 inches thick, white oak boards and the walls were 1 inch tongue-in-groove boards that were nailed with square-headed nails. “It was so solidly built that I moved the walls without disassembling them,” he said. Walter operates a small cut-your-own Christmas tree farm. When his parents bought the land in 1961, there were 3,000 plus trees already there, so it was a no-brainer to start up the business. The barn will be used to hold his equipment. Walter is a member of Friends of Ohio Barns, a group that works to educate and bring awareness to old barns, an icon of our culture. “Even if you, personally, don’t have a use for your barn, you need to make it a priority to keep the roof and the foundation repaired so that it won’t fall down on your watch,” Walter said. 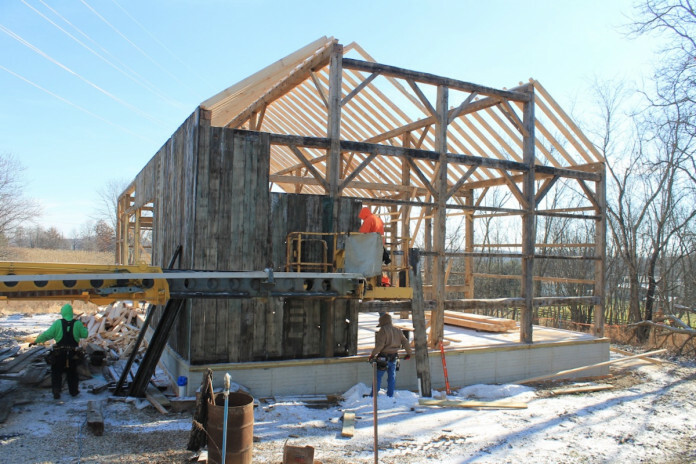 Alan Walter, Carrollton, Ohio, moved this 1880s timber-frame barn from Strasburg, Ohio. 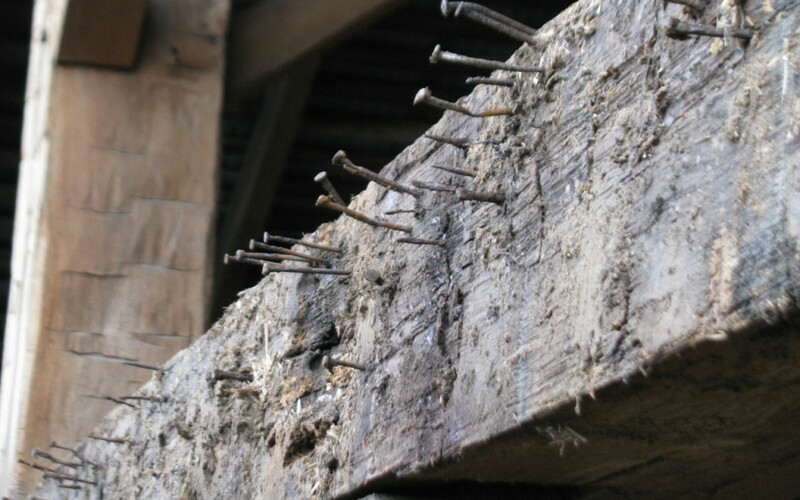 But he first removed the tar paper covering the chestnut siding; collecting three 5-gallon buckets of nails. 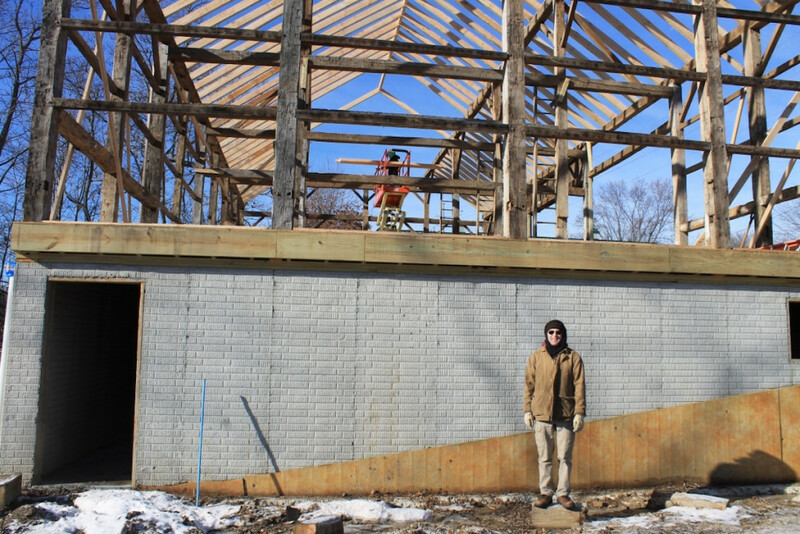 Alan Walter stands in front of the timber-frame barn being rebuilt on his farm in Carrollton, Ohio.